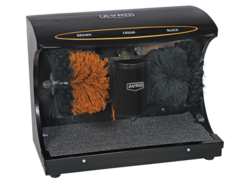 Avro is the leading supplier of automatic shoe shiner machines all over India. Top quality rotary motors and brushes are used in our shoe shiners. Highly reliable, efficient, hygienic aesthetic design suitable for Five star Hotels, Restaurants, Officers, Golf Clubs, Airports, Stadiums etc. We are actively engaged in supplying best of Shoe Polisher Machine. These offered machines are best in class. 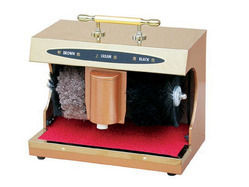 These shoe polishing machines are designed for polishing shoes. 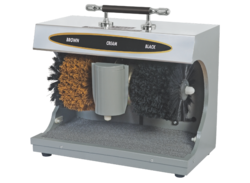 These machines are available with smooth brush and two color polish options. They are easy to use and very smooth in the finish. Our offered array is very cost effective in rates. AUTO CUT : 15 Sec. 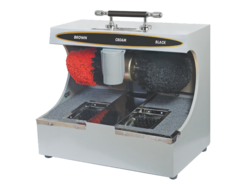 We offer Automatic Shoe Shine / Polishing Machine suitable for black and brown shoes. Sensor based, electrically operated, single phase with liquid cream dispensers. 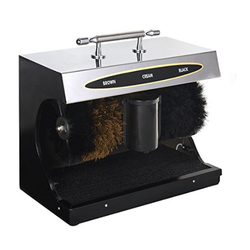 Product Description :We offer qualitative range of Shoe Shining Machines designed to cater to the needs of hospitality industry. Once a shoe is placed in the bracket meant for it, it begins rotating automatically, removing dust from the shoe. A cream polish dispenser with nozzle is provided to dispense cream polish. One need to first press the shoe against the nozzle for cream and than hold the shoe under the black or brown brush so as to get shoes shined and sparkled to perfection, within 15 seconds.